In last week’s 15 in 5, number seven mentioned an impending proposal. It seemed like I was spoiling a huge surprise, but my friend Colleen lives in Chicago. She won’t see the paper in print until I deliver her souvenir copy. Update: Andy asked, and she said yes. 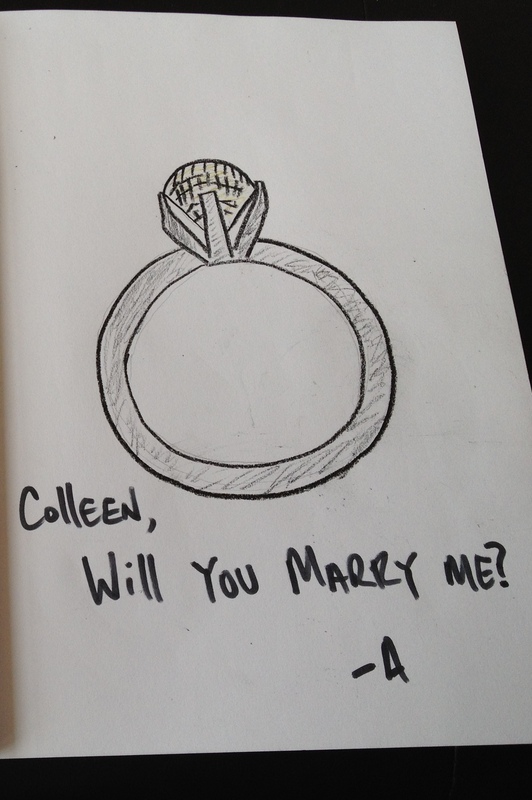 He wrote and illustrated a book, documenting various milestones in their relationship, with the final page asking “Will you marry me?” It was sweet and meaningful, and to them, full of just enough fanfare. Afterward, they joined close friends at a planned engagement party at a bar. I have never seen Colleen so happy. That happens when someone is engaged, doesn’t it? There’s usually a shiny ring, an exciting story, and a wedding to plan. I wasn’t much for the wedding planning part. Some little girls dream of their wedding day, practically planning every detail before there’s even a suitor. While I had a great time at our wedding, the details were insignificant to me. The only important detail was that The Man asked me to wake up next to him every morning for the rest of his life. All that mattered was that he chose me. Ok, that and a top-shelf open bar at the reception. I remember those first few days after the proposal. You find ways to place your bejeweled hand in the middle of the conversation, hoping that everyone will congratulate you. And they do. People want to know the story. “How did he do it?” They all ask, whether they care or not, and you excitedly tell each and every person. How did he do it? Well, try not to judge. I do love The Man, and I was over-the-moon excited that night. Simply put, I was utterly shocked. He cooked dinner that night, which wasn’t all that unusual back then. The Man is a really good cook, but once he learned that I could prepare the meals, he quit cooking everything but quesadillas and grilled meat. After a great meal, we enjoyed a bottle (or two) of wine in the rocking chairs on our beloved screened porch. We rocked. I put my feet in his lap. In one (not so) swift move, he pushed my feet off of his legs, moved to the ground in front of me, and rested his arms on my knees. “I love you babe,” he said sweetly. “I love you too.” Um, ok? What are you doing on the floor, you fool? Honestly, I have no idea what else he said. It was all tunnel vision at that point. I saw the ring and couldn’t see anything else. And then I realized he was sitting there, waiting for me to answer. My first words? “If this is a joke, it’s a really sick joke.” Yep. The most romantic moment of a girl’s life, and that’s what I said. Of course it wasn’t a joke, and obviously I said yes. Ten years later, we still laugh about it. If you know us, you know it’s completely us. We’re not all that typical. As a matter of fact, on our honeymoon, in an attempt to try something traditional, The Man carried me over the threshold. Cute, right? Well, he actually threw me over his shoulder like a sack of potatoes, emptying the contents of my purse all over the floor of our hotel room. Trying to survey the damage, he spun around, smacking my head into the wall. For Colleen and Andy, the next months will include making the guest list (yuck! ), planning the reception (yay! ), and answering the repeated “So, when do y’all want to have kids?” Watch out for the inevitable door frame, but don’t worry if your story doesn’t read like everyone else’s. It’s all yours, and it’s no joke.